Weigh your dessert options carefully. 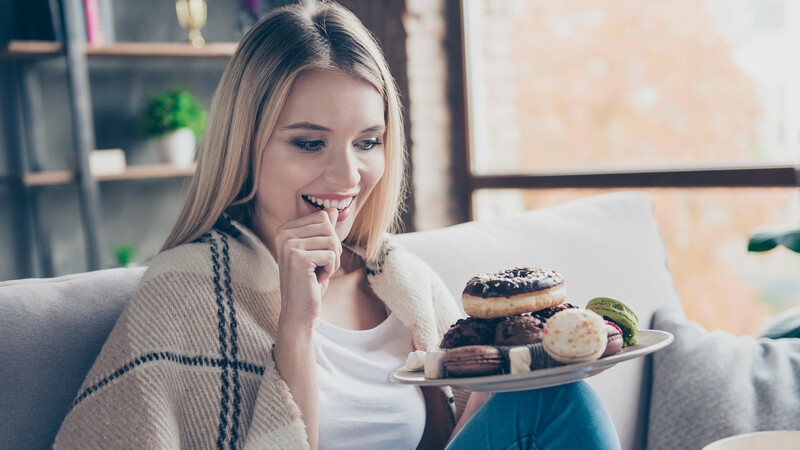 Choosing an indulgent, high-calorie dessert — rather than something like fruit — could be a secret to eating fewer calories, according to research published online Thursday by the American Psychological Association. Researchers put either a healthy dessert like fresh fruit or a less healthy dessert like cheesecake at the beginning or end of a cafeteria line. When people chose the cheesecake at the beginning of the line, they subsequently opted for a lower calorie meal and “ultimately consumed fewer calories than diners who chose the fresh fruit first,” the study found. In fact, they ate 30% fewer calories including dessert than the diners who chose the healthy option. This did not happen when desserts were put at the end of the cafeteria line. This isn’t the first study to show that eating dessert can help you drop pounds. A 2012 study revealed that people who had dessert with breakfast lost more weight than those who didn’t indulge. Of course, there’s a catch: Both groups were on a low-calorie diet. The researchers believe the dessert at breakfast helped curb hunger and cravings that could lead you to later overeat. Of course, plenty of people who have cut out dessert think it helped them drop pounds. And in both cases where people ate dessert, they also tended to eat less overall.